Students from Hill End PS visiting Hyde Park Barracks. Photo courtesy of Christopher Grossett, Principal, Hill End Public School NSW, 2015. One convict who once slept in the same hammock dormitories was Francis MacNamara, also known as Frank the Poet. While held at Hyde Park Barracks in 1833, he suffered multiple floggings and other punishments, and wrote one of his most famous published poems ‘A Dialogue Between Two Hibernians at Botany Bay’. His talent for writing and reciting his poetry that described the cruelty of the convict system made him famous amongst his fellow convicts and unpopular with the authorities. After receiving his pardon in 1849, he made his way to the Tambaroora goldfields where he was welcomed as a local celebrity. MacNamara made his fortune in the goldfields surrounding Hill End, but died suddenly in 1861 from hypothermia. The Hill End students had the opportunity to travel from their unique historic township to experience a totally different aspect of our colonial story through Unlocking Heritage, a two year trial project initiated by the NSW Office of Environment and Heritage. This program provides financial support to eligible NSW primary schools by providing a travel subsidy to attend learning experiences at heritage sites managed by Sydney Living Museums and National Parks and Wildlife Service. 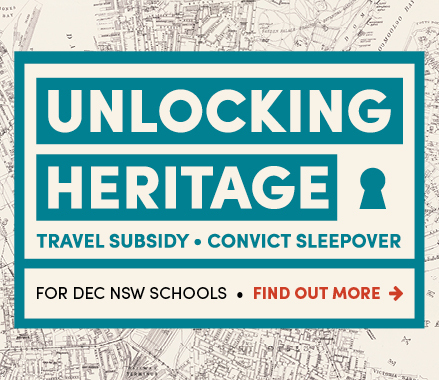 In addition, NSW rural and regional primary schools can attend an exclusive Unlocking Heritage Convict Sleepover at Hyde Park Barracks Museum with the cost of food, accommodation and program all covered, plus financial assistance towards the cost of travel to Sydney. Find out about the eligibility criteria, and how to access this special program. To find out more about the convicts who spent time at Hyde Park Barracks, go to A day in the life of a convict.